This corresponds with our pattern class 6 which is standard for our pooling services. What do we allow in case of mis registration? The area lying between the outer rim of the solder pad and the solder hole. 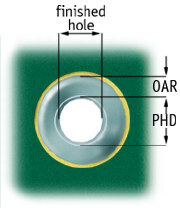 As a result of the hole being drilled more or less off-centre, the annular ring may be broken.This depends on the nominal outer diameter of the solder pad against the nominal diameter of the hole. 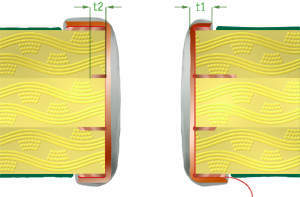 The width (t1) of the annular ring on outer layers must be >= 0,050 mm on the finished board.